RJT reports two MSN Messenger for Mac 4 features not mentioned before. 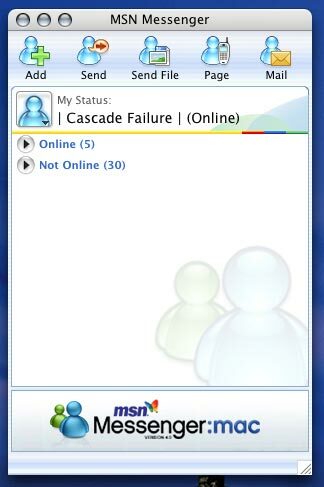 One of them is the ability to set a sign-in status (online or invisible) before signing in to MSN Messenger (screenshot). Another new feature is Error Reporting and Auto Recovery (screenshot): when the application crashes, it sends an error report to Microsoft then re-launches the application so you don't have to bother doing anything but aknowledging the report (Windows users are well familiar with this procedure). The old fool gained another year! Yes, today is the day we celebrate that the biggest mess master in the universe gained another point on his age stats. This morning, one of our top-reporters managed to take a picture of our birthday boy eating his cake. Link to Mess with MSN Messenger and win! - the latest approved website gets a unique listing. Place one or more of the linking codes we suggest (text or button) without modification on your website and inform us about it. 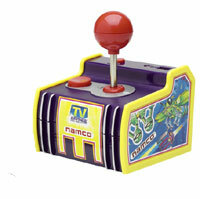 Not only can your website gain a lot of exposure and new visitors, but everybody who links to us according to the new rules and submits his or her site using the form, gets a chance to win an Atari-10-in-1-Ready-To-Go-Game-Console or a Namco 5-in-1 Arcade Classics for some retro-style (webcam) gaming*. Let's get started, find the linking codes and submit your site here! NOTE to ALREADY LINKING webmasters: You too get a chance to win if you notify us about your link using the form on this page! (*prize can be discussed and replaced with any product worth $47 US available at Firebox). Another update today on the interior MSN Messenger site (We've named it internal before, but that seems to be the wrong name according to Microsoft). This time we won't tell you the release has been delayed again, no this time we are going to provide you with the information that all of the features we have mentioned earlier have been canceled. This also confirms our suspicion that the so called deluxe display pictures aka animated avatars are going to be an integrated version of the Korean MSN PowerPlus. So what did change? They have added some more spam about getting MSN Explorer in order to use MSN Photo Swap. The graphics in the help files got a little bit smoother. And they have translated the new pages to many more foreign languages. 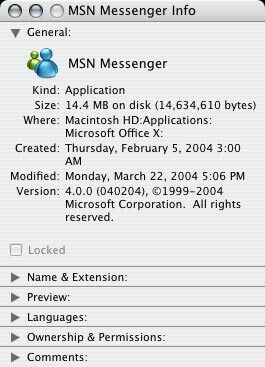 If we make a sum of all the changes and information available on the interior site, we can say without a doubt that even the scrawny MSN Messenger 4.0 for Mac update is going to be a bigger "revolution" than MSN Messenger 6.2. I just got word the Bad Mother Fucker Wallet (from Jules Winnfield in Pulp Fiction) are back in stock again. Quentin Tarantino, check out the Pulp Fiction and Kill Bill display pics! Hotmail Deframer by Dempsey will automatically deframe long confusing Hotmail-formatted hyperlinks into one small simple link (currently for IE only). When you find a link in a Hotmail message, right-click it and select Hotmail Deframer to open it in a new, deframed window. 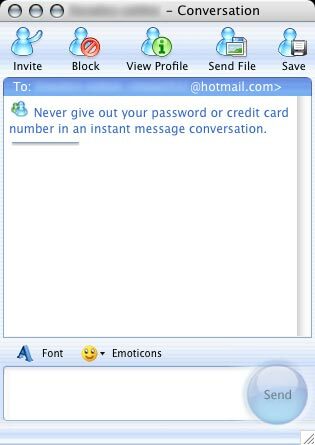 The home of this Hotmail plugin also hosts an MSN Messenger chatbot created by Mark. Add bot killercarrot.co.uk to play games, earn carrots and get rewards! Timothy's plugin for Internet & Windows Explorer allows you to right-click any JPG, JPEG, BMP, (animated) GIF, PNG file (size doesn't matter, guys!) and automatically import it as your current display picture in MSN Messenger 6.1 and up. Version 2.0 comes with support for dynamic images, a display picture previewer, an advanced picture editor, image zoomer (and cropper) & original file names. All this and a bag of chips nicely formatted into a graphical user interface. Other updates include: better Internet Explorer support (even for XP SP2), better Windows shell integration (only appears on images now), faster load, much more stability, easier install/uninstall and a lot of bug fixes. >> Download the super handy Internet Explorer Display Picture plugin. 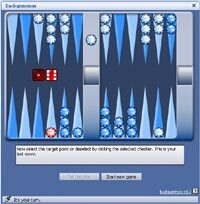 Windows X just released what's probably the last version for 6.1 of his MSN Messenger 6 - Windows X edition, a full-featured MSN Messenger 6.1.0211 skinner with an impressive portfolio of 25 themes. What's new in this version? >> Download MSN Messenger 6 - Windows X 5.1.211. 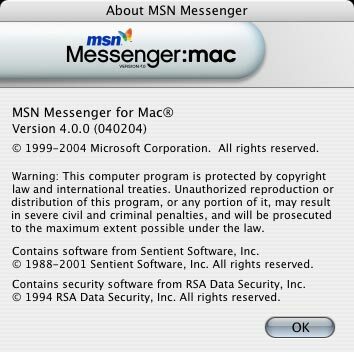 In addition to Timothy's news posts with details on (the lack of) features in the upcoming MSN Messenger 4 for Mac, we now have some screenshots thanks to XP_2003, member of the Neowin forums. Here's one for the soccer fans: Chibi Link submitted 31 slick soccer shirt display pictures featuring European top clubs. Hopefully yours is featured already but more might be added later! >> Browse the Soccer Shirts display pictures. Finally Backgammon, the game of luck and skill, is available on games.mess.be. A massive thanks to Neil for providing the cool images! Please post any bugs or comments in the games.mess.be forum. There are now eleven custom-build games available; Backgammon, Battleships, Chess, Connect4, Hangman, Memory, Mine mess, Nine Men's Morris, Reversi, Tetris and Yahtzee. >> Download the Custom Games patch.